The Guggenheim was commissioned by the client. 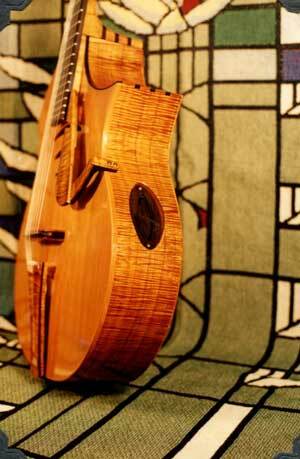 The final design was a collaboration between the luthier and the client. Design to completion took place from May 2000 to October 2001. 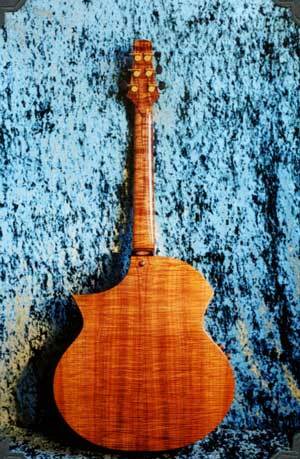 Body Wood: bookmatched Redwood carved-top with matching set of master grade, highly figured Hawaiian Koa for the back and sides. Top and back plates are tap-tuned. Neck Wood: highly figured Koa neck with an Ebony fingerboard, The heel of the neck is a lamination of three layers of ebony and two of koa. 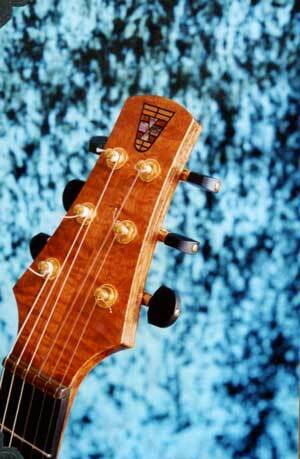 Headstock includes a veneer of striped ebony with a koa cap, front and back. Bracing: the redwood top is x-braced with a lamination of redwood and carbon fiber. The back is cross-braced with mahogany brace-stock. The back conforms to a radius based on a cross-section of a 15' circle. The sides are braced on the inside with sycamore with koa inlays. These side braces include a motif consisting of three lines which are abstractions of architectural features found within the Guggenheim Museum. The body of the instrument also includes 'sustain-bar' connecting the neck and the end-block. This structure makes no contact with the top of the back plate. Finally, the neck of the instrument is braced with three graphite-bars which add stability to the neck and contribute to overall sustain of the note', in similar fashion to the aforementioned sustain bar. The graphite-bars are imbedded directly underneath the fingerboard. 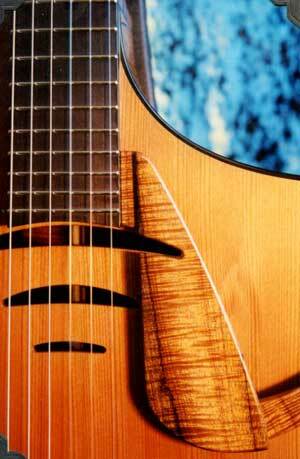 Soundholes (or Apertures): a total of five openings are found on the instrument. 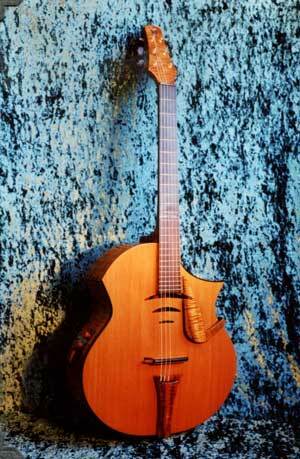 The top plate includes three soundholes which are curved line abstractions of the Guggenheim structure. One of these may be dosed with an ebony cover plate. Two additional soundholes are found on the sides of the instrument. The aperture the oval soundhole on the 'cutaway' side of the instrument may be altered by placing one of several ebony plates in front of the opening. Each plate contains a different aperture. The last soundhole or opening is located within the electronic preamp plate. This small 'Canoe' shaped hole may be left open or closed. The soundholes are interactive, meaning that each time the size of one is altered, the character of each and the sum is also changed. Thus, the ‘resonant pitch' of the instrument may also be tuned. It should be noted that while a certain setting may yield a 'pleasant’sound acoustically, it may also be unusable when the internal microphone or piezo element is utilized. This is especially apparent with the internal microphone where electronic feedback can be hard to control.